Amazingly, the Toyota Camry was offered with a manual in America up until the end of 2011. The car you’re looking at wasn’t the last manual Camry we got here. Not by a long shot. 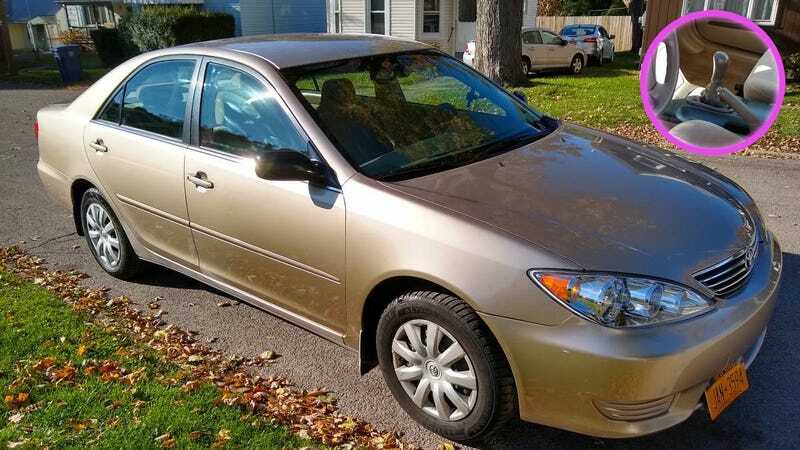 It’s a 2005 example that my coworker Mike Ballaban showed me today (oddly without his usual SELL YOUR VW AND BUY THIS NOW message) was still years away from the death of the three-pedal Camry. The seller is asking $3,500 upstate. This was, however, the first generation of Camry that Americans could only get the manual on four-cylinders, sadly, but it’s still a remarkably modern, manual midsize family car. You’re looking at 160 horsepower on this thing with a five speed, though later Camrys would get up to 179 on a six-speed. Weight was a bit over 3,100 pounds for these cars, pretty much what it weighed from the 1990s through the 2000s. Toyota wasn’t changing the Camry much since its 1992 Lexus-ification. I would normally spend my time at the end of this blog saying how much I miss weird Camrys of yore, but the new one is bizarrely entertaining in top trim and Toyota is giving us a TRD trim because crossovers are normal now and sedans must be strange. Still, that doesn’t stop me wishing Toyota still sold the Camry with a manual. And a non-electronic handbrake. And 4WD with a locking center differential like you used to be able to get on All-Tracs. But that’s getting away from the point.